In last week’s Friday Wrap-Up, we had a brief post about another upcoming beer festival in Fredericton – the “Brewer’s Bash“, hosted by Picaroons, will feature 60 Canadian breweries and 300 beers on Saturday, July 13th. The event will run from 11:00 am – 11: 00 pm in Officer’s Square; tickets went on sale today for $25. If this wasn’t enough to convince you to attend the event, we now have some more information to share, thanks to Dennis Goodwin, Marketing Director for Picaroons. The $25 will get you a bracelet that allows admission and re-entry into the festival all day. There will be lots of food options IN the festival, if you choose not to leave. The ticket price includes a 4-oz tasting glass and 6-8 drink tickets that are good for one pour each. After that, you are welcome to buy as many additional drink tickets as you’d like to sample more beers… these will run in the “one-dollar range”. They also plan to have some live bands playing towards the end of the festival. Some great breweries, there… and that’s just a few of them! We’ll release further details and a complete brewery list when they become available. Also, be sure to follow the Brewer’s Bash on Twitter and Facebook. Meanwhile, you can buy your tickets NOW online or at The Cedar Tree Cafe in Fredericton. 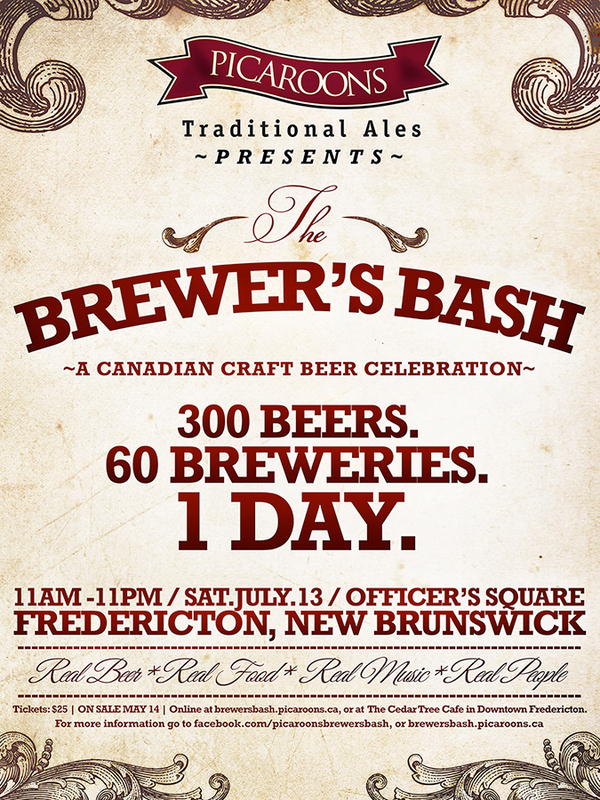 I was wondering if there was any extra tickets for the Brewers Bash on July 13th in fredericton? Will there be more released? I’m in need of 4 tickets! Kijij is also full of people wanting tickets as well to this event.